I am going to investigate the rate of reaction between two substances: calcium carbonate and hydrochloric acid. Different reactions can happen at different rates. Reactions that happen slowly have a low rate of reaction. Reactions that happen quickly have a high rate of reaction. For example, rusting has a low rate of reaction. Explosions have a high rate of reaction. A reaction must be at a convenient speed to measure, because a fast rate of reaction can be hazardous, and a very slow rate of reaction is not practical. which allow the volume of collected gas to be measured. The increase in volume can be timed, and a graph of volume against time can be plotted. This shows the rate of the reaction. Equipment: a gas syringe, rubber bung, conical flask, stand, clamp, 25ml hydrochloric acid, 2g medium sized calcium carbonate pieces, and a stopwatch. 1) The gas syringe should be set up horizontally by an attachment to the stand, by the clamp. The tubing should be positioned well on the rear end of the gas syringe. 2) Place calcium carbonate in conical flask, and quickly pour in hydrochloric acid. The rubber bung should be placed extremely fast after this process, as well as the starting of the timer. 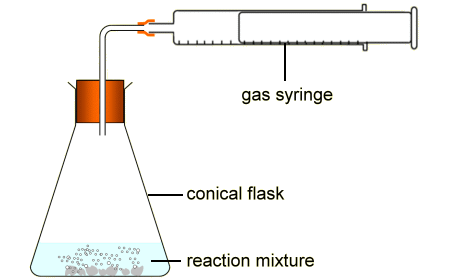 The gas molecule products produced from the reactants in the flask are transferred from the flask to the gas syringe by the tubing by the movement of gas. The gas products are carbon dioxide and calcium chloride. The pressure in the gas syringe is built up because of the air-quality of the gas syringe, where it is air tight. This pressure is realised by a push forced onto the plunge inside of the gas syringe, which shows the exact ml of product produced to be visible by the scale of measurements on the outside of the gas syringe. This method of measurement in products is extremely easy to measure and set up. It’s also very easy to reset, and is pretty advanced compared to some other methods, like for example timing and observation, where the reliability depends on the quality of eyesight, which is never 100% accurate and will vary with different individuals. In other terms, there’s less dependence on human ability, which can easily cause an error. This method proceeds in a reliable and scientific manner whilst also being easily set up and measured. Compared to, for example, timing and observation, this method is harder to set up and takes away time which could’ve been used to record more results, therefore providing more reliability. However, unlike timing and observation, this method is far more accurate, so a result or two less would not be much trouble. In this method, there is quite a lot of equipment used, which makes the scientist depend on the equipment, and it not failing or breaking. This method is simply done by looking and timing for a particular interval, i.e. 30 and 60 seconds. 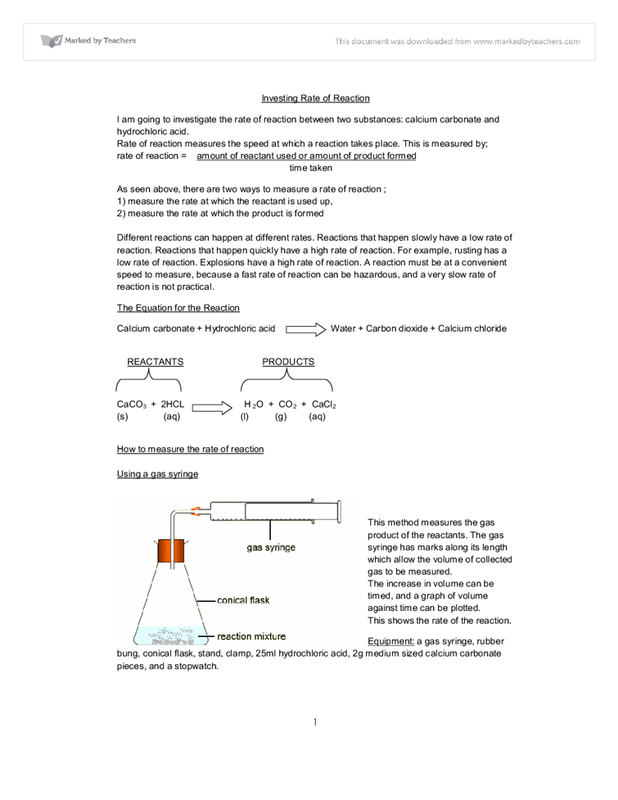 Equipment: flask, reactants, and timer. This method is easy to set up and reset. The time availability given by the easy set up allows more time for more results, which means a fairer range. This method is unreliable due to the fact it is dependent on human eye sight, which can never guarantee accuracy. Water is where if you put an element in water, the amount of water displaced (thrown out) is equal to the volume of that element- so by measuring the overflow of water; you can work out the volume of the object (it only works if the object is non-porous). 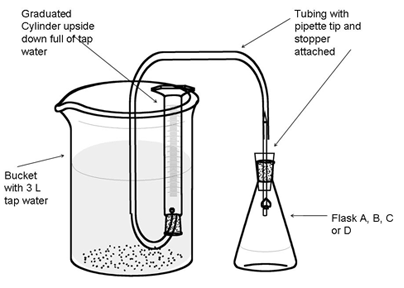 Equipment: a conical flask, rubber bung, rubber tubing, water tray, measuring cylinder, the reactants, bee hive shell, white paper, delivery tube, and a stopwatch. 1) The equiptment for this method is set up by attaching the bung and rubber tubing to the flask, and then placing the tubing underneath the beehive shell, which then is inserted into the cylinder, which should be full of water (by careful procedure). This whole method (apart from the flask and part of the tubing) should be carried out in a water tray, full of water. 2) The calcium carbonate is mixed with the hydrochloric acid in the conical flask. The timer starts straight after this. 3) As the reaction takes place, the gas products move towards the measuring cylinder, where the water is replaced with the gas molecules. At the end of the experiment, (i.e. a 30 or 60 second interval), the scale on the cylinder shows the amount of water lost, and so therefore, the amount of gas gained. This method produces rather reliable and scientific results, if, of course, it is set up properly to measure. This method does not require skill since it is dependent on the equipment. This method was hard to handle, set up, and reset. The CO2 can also dissolve into the water, which isn’t practical. It is dependent on the equipment, which also widens more room for error in the equipment used. It is also time consuming, which isn’t practical. The process of making a solid from a solution is called precipitation. The solid itself is the precipitate. with an acid or alkali. Equipment: reactants, paper, conical flask, and a stopwatch. 1) The reactants are mixed in the conical flask. Underneath of the flask, an ‘X’ is marked onto the paper, in the middle. 2) As the reaction proceeds, the ‘X’ gets harder and harder to see because of precipitation taking place. When the ‘X’ is no longer visible, the timer is stopped and the timing is measured. This method is easy to set up and reset, especially compared to a lot of the other methods like the displacement of water and gas syringe. The simplicity of this method does extent the time availability, which allows more results to be carried out. More results do mean a fairer average. This method did not prove such reliable measurements and results seeing as the observation would have to be done using human activity, especially eyes instead of a reliable apparatus. It would also give a limited range of results. The main con of this method is the variation of eyesight used, meaning low quality of eyesight isn’t practical, and the different interpretation of when the ‘X’ is no longer visible is also unreliable. This method works by measuring the loss of mass as a as forms. Cotton wool is inserted. 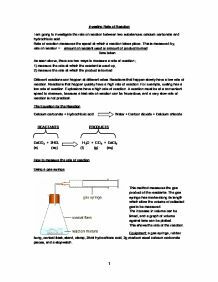 1) The flask is put upon the top pan balance, and it is reset to 0, so that the weight of the flask is not included (only the weight of reactants). 2)The reactants are set up and mixed. The timer is started straight after. The mass should lower as the time increases. 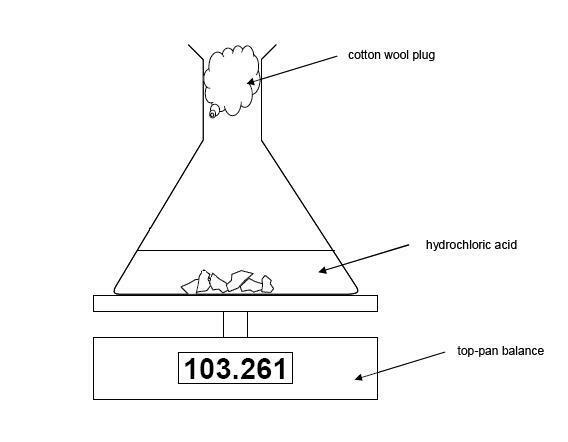 Equipment: reactants, a cotton wool plug, conical flask, timer, and a top pan balance. This method is easy to set up and reset, as well as to time (like most of the other methods). The easy set up allows more time for more results which allow a fairer mean. No human skill is needed here like for example eye sight, because this experiment is equipment reliant, which therefore decreases the chances of an error. The measurement of the experiment would be difficult. Also, the fact that we have to reset it to 0 at the start, whilst the reactants are already reacting, provides unreliable timing, and therefore unreliable results. After trialling all of the methods for measuring the rate of reaction, I have formed a clear view of the reliability of each method, and the practicality. In general, the human dependent methods turned out to be the least feasible, i.e. timing and observation, and observation of precipitation. In the science industry, a human reliant factor would be extremely impractical because of the lack of accuracy. Although these methods were far simpler than the rest, they were also the least reliable. This is why I reject these two methods. The measurement of mass as a gas forms was also another easy yet impractical method, because the hassle forced on the scientist before the timer had to be set was far too much. The fact that the reactants had already started to react whilst the timer hadn’t even been set yet due to the fact the top pan balance had to be reset was an extremely unreliable factor. I therefore reject this method of measurement. The available methods left are the gas syringe method, and the displacement of water, which compared to the others, turned out to be the most practical, reliable and innovative ways of measurement. These methods were equipment dependent, which is a much more accurate asset than them being human dependent like most of the rejected methods. 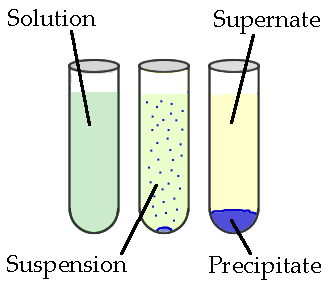 The displacement of water method provided reliable results, produced by a scientific method. However, the set up of the method was the hardest out of all the other methods, and required attention. The increased number of equipment used provides a more equipment dependent method, which, if one part of the equipment fails, so will the whole method. I reject this method purely and simply because of the hassle of equipment and the time absorbing attention it required. I also reject it because the carbon dioxide produced from the reactants can dissolve in the water which provides unreliability. The only method left to use is the gas syringe, which appeared to be the most reliable and feasible to set up, as well as being a scientific way of measuring. The setting up of this method does not require so much hassle or attention, yet the procedure of measurement provides accurate results. This is why my chosen method for measuring the rate of reaction is the gas syringe method. This is a well written and researched piece of investigation. It is supported by clear figures that add to the textual information provided. It is two stars as it only covers the initial research into the appropriate method. This could not be submitted as it is incomplete. Influence of pH on the Activity of Potato Catalase. Disappearing cross (aka Rate of reaction). To investigate the effect of ph on the activity of trypsin. Marble Chips and Hydrochloric Acid. Investigate the rate of reaction between hydrochloric acid and calcium carbonate. A clamp stand will be positioned next to the container, holding a boiling tube. A plastic tube will connect the boiling tube and the measuring cylinder, allowing the carbon dioxide given off, to be measured in the cylinder. We will use different concentrations and volumes of hydrochloric acid to calculate the rate of the chemical reaction. a minimum kinetic energy called the Activation Energy shown on the energy level diagrams below. * o Going up and to top 'hump' represents bond breaking on reacting particle collision. o * The upwards arrow up represents this minimum energy needed to break bonds to initiate the reaction. that's what the results would look like is similar to the proper one. The results are not entirely accurate as there has been many things that will have contributed to the unreliability of them. Such as you could not tell whether the gelatine had dissolved and when it did dissolve you were unable to get the time exact. Hypothesis: For a reaction to take place two particles must collide. For this to happen they must first have the required activation energy, this is the minimum amount of energy that they must collide with for a reaction to take place. a small effect on the results as the enzyme and substrate amounts will have varied and the rate at which products are formed will have increased or decreased. To eliminate human error in the experiment the measurements and timing would have to be done by using more technological equipment, in order to gain precise results. Chemical reactions very often need extra energy to start it off. Some chemical reactions need heat like the reaction between hydrogen and oxygen. The minimum amount of energy needed to start the reaction is called the 'activation energy'. Unless the particles have enough energy to add up to the activation energy needed the reaction will not start. This essay has been marked by a teacher! Download the essay PDF to get all the teacher's notes and advice.